In conjunction with Faraday's Kitchen Store, Lakeway, TX, I am pleased to announce my spring Give-Away! 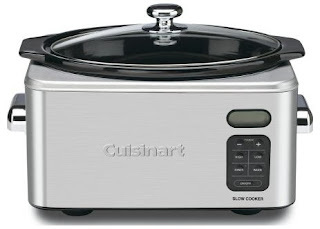 One lucky winner will receive a Cuisinart 6.5 qt. Slow Cooker! Join me on Sunday, April 18th at 1:30 at Faraday's Kitchen Store for my Slow Cooker Beer and Beef Stew demo/tasting followed by the LIVE drawing! Just send an email with the subject line ADD Slow Cooker and you are entered!